I distinctly remember watching the 36th episode of Good Eats when it originally aired. My dad and I watched the episode together in their TV room and I had a huge inkling to try Alton’s pizza recipe then and there. Fast forward, oh, 14 years and I finally got around to making his pizza last weekend. 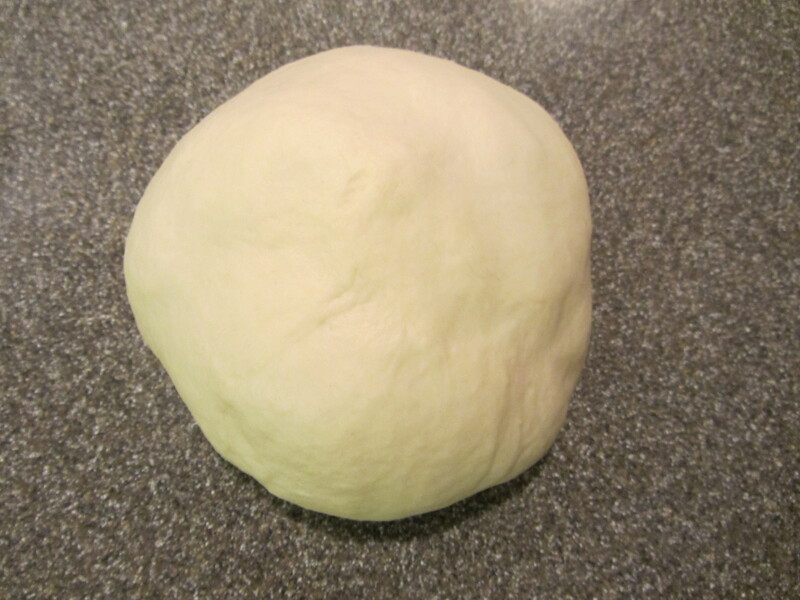 In the interim, I tried numerous homemade pizza dough recipes, finally stumbling upon a favorite a few years ago, which has been my “go-to” ever since; it is easy, fast, and produces enough dough for several pizzas. I was, therefore, skeptical that Alton’s pizza dough (or anyone else’s for that matter) could surpass the dough I regularly use. Still, though, after 14 years, I was excited to finally try that recipe I had intended to make for so long. 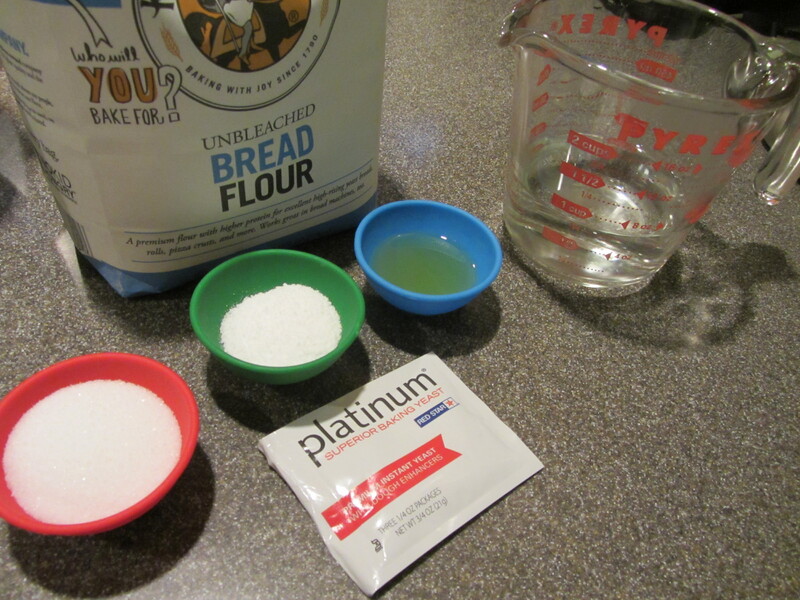 Ingredients for Alton’s pizza crust: sugar, Kosher salt, olive oil, instant yeast, warm water, and bread flour for bread machines. 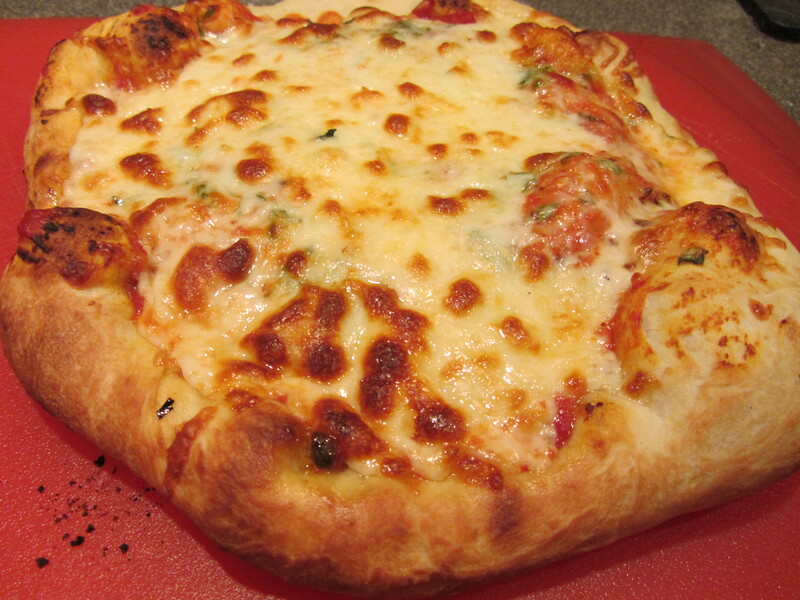 To make Alton’s Good Eats pizza, place the following ingredients in the bowl of your stand mixer: 2 T sugar, 1 T Kosher salt, 1 T olive oil, 3/4 C warm water, 1 C of bread flour for bread machines, 1 t instant yeast, and one more cup of bread flour for bread machines. 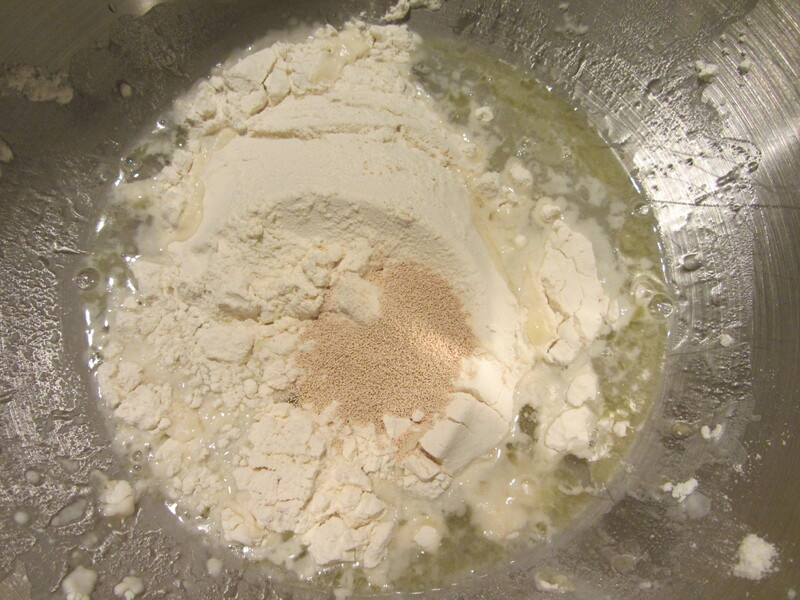 Note: instant yeast is NOT the same as active dry yeast. Instant yeast is used in this recipe because it needs no blooming in water, and therefore can be added directly to the dry ingredients. 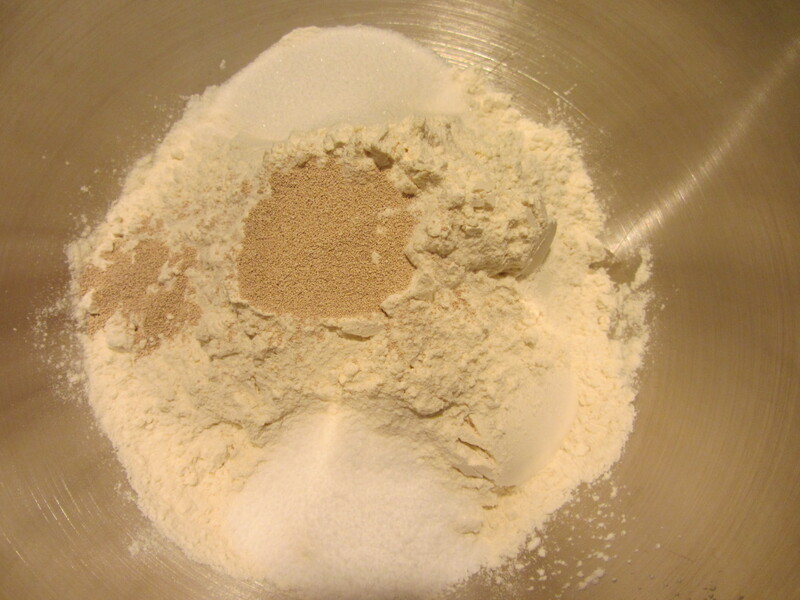 Also, you want to use bread machine flour because it has the highest protein content possible, which will result in maximal gluten development. Yes, I happen to belong to the seemingly endangered species of human who believes that gluten is, in fact, a wonderful thing. 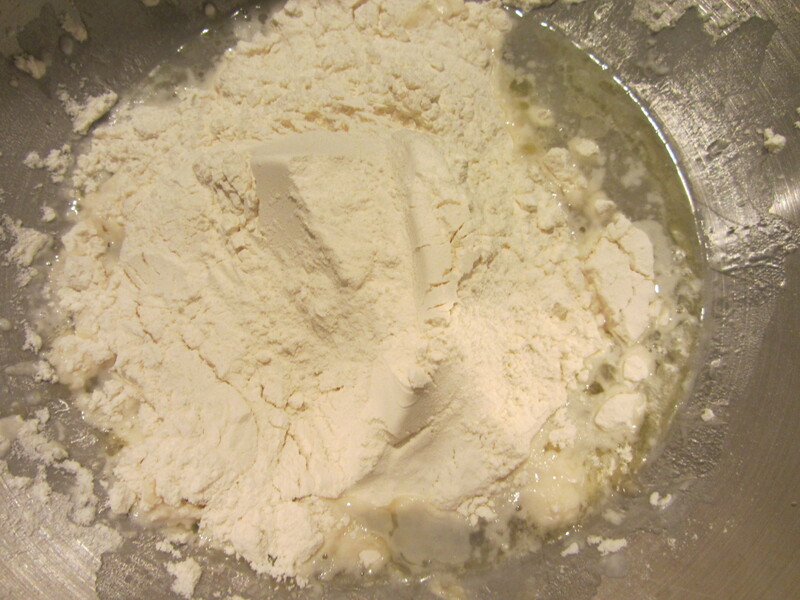 Anyway, using the paddle attachment on your mixer, start mixing on low until the dough forms a ball and pulls away from the bowl. Starting to mix with paddle attachment. 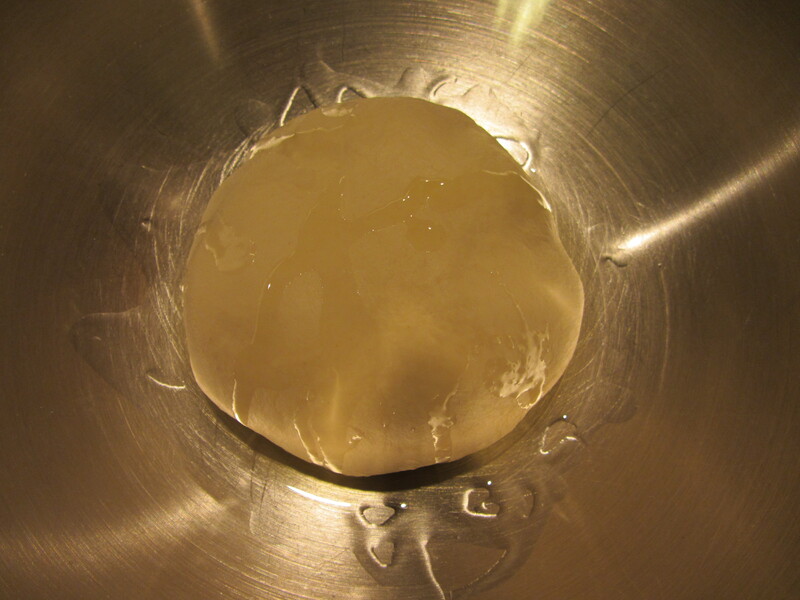 Dough forming ball and pulling away from sides of bowl. 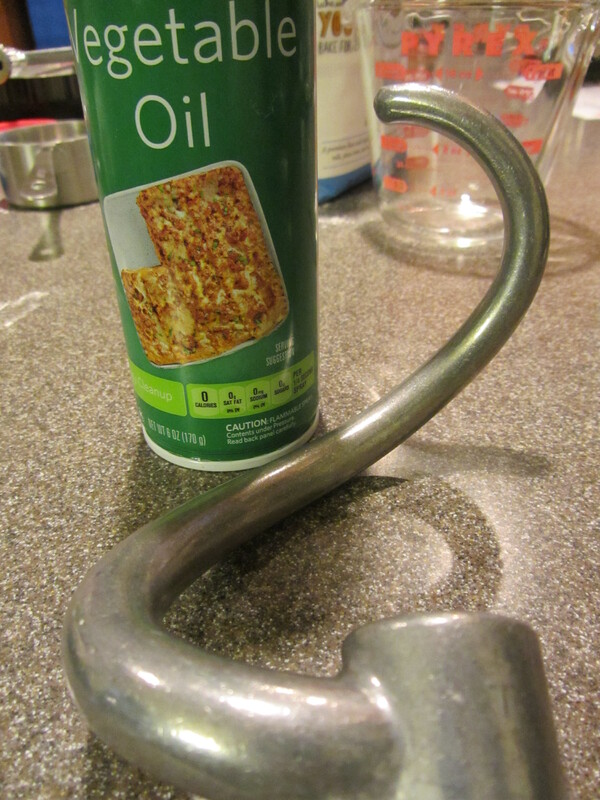 At this point, spray your dough hook with non-stick spray and replace the paddle attachment with the hook. 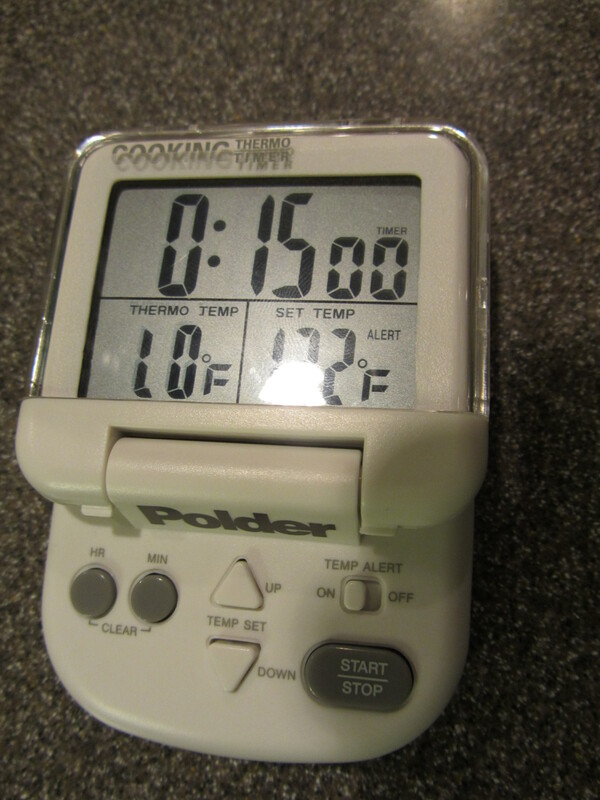 Allow the machine to knead the dough for 15 minutes at medium speed. 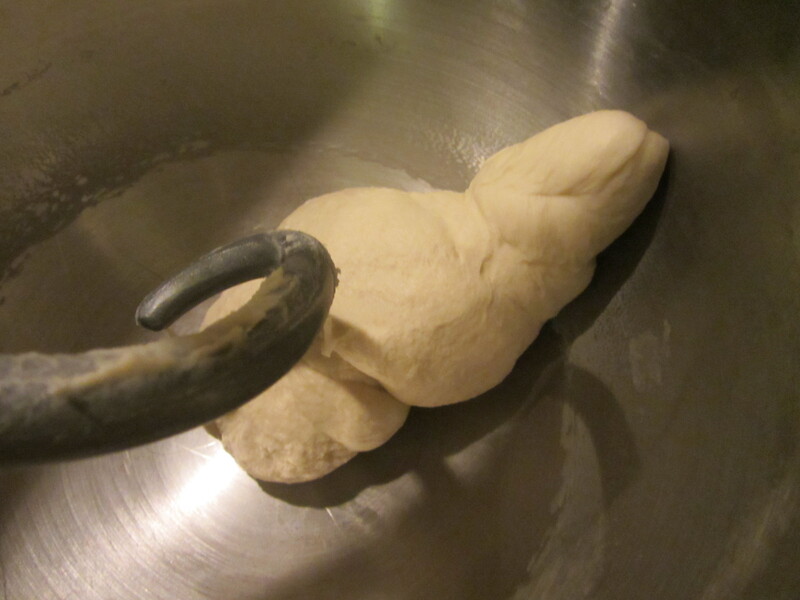 Even with spraying my dough hook with non-stick spray, my dough still seemed to climb the hook, so I sprayed the hook a second time midway through the kneading. 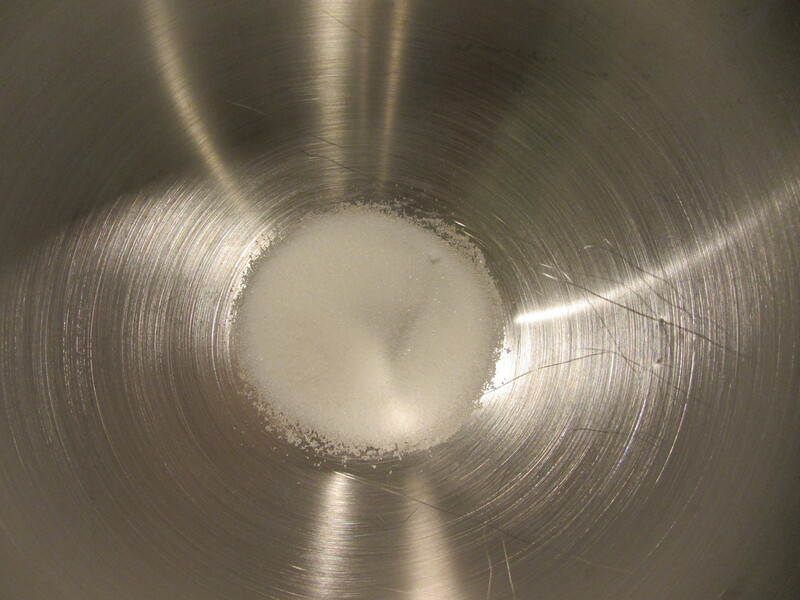 Dough hook sprayed with non-stick spray. 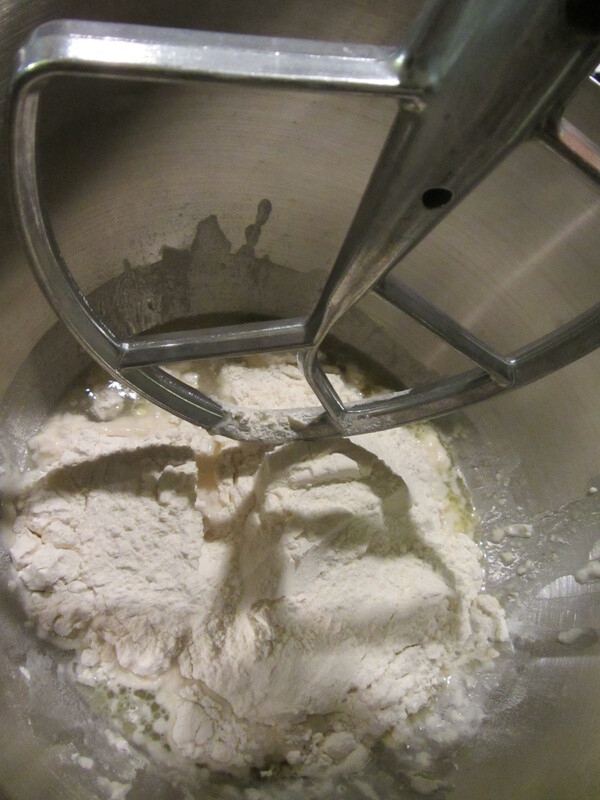 15 minutes of kneading time by the stand mixer. 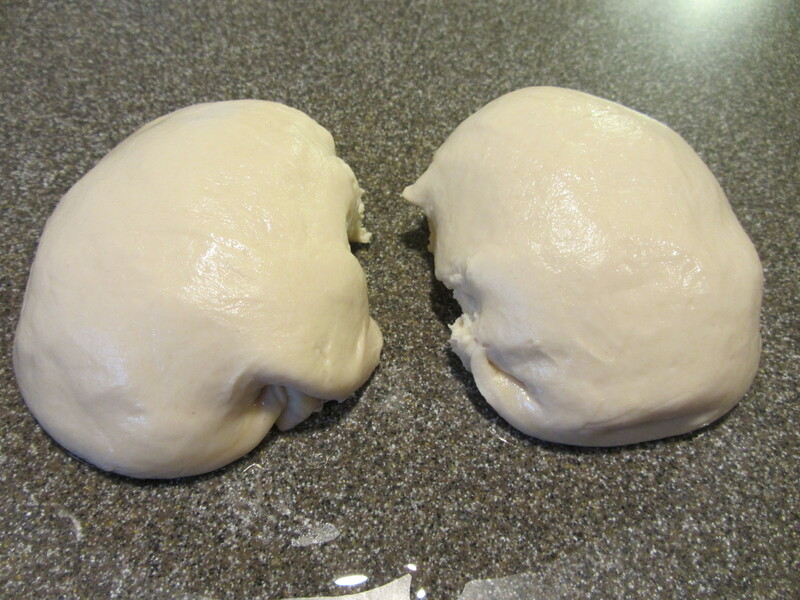 Dough after 15 minutes of kneading. 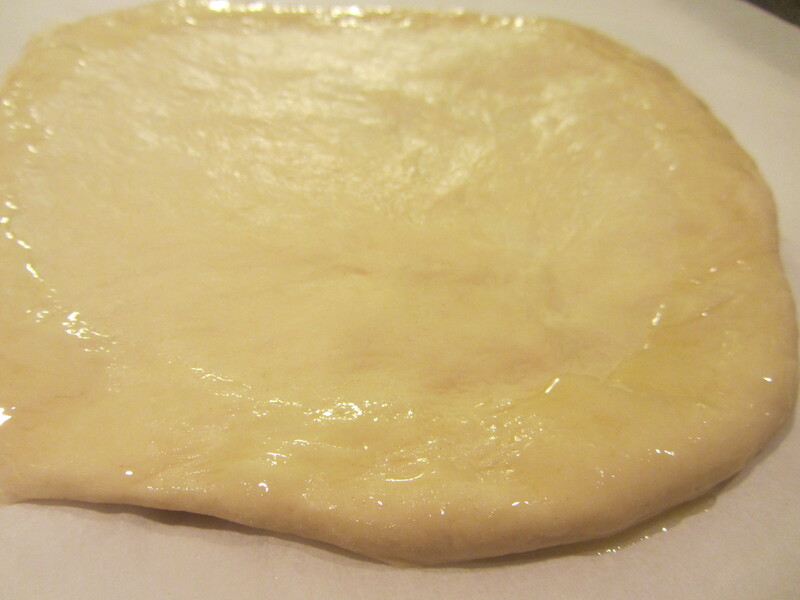 After 15 minutes, tear off a small piece of dough, stretch it into a thin round, and hold it up to the light. If the dough is transparent and you can see your finger through it, your dough is ready to go; this is the windowpane test you hear about in baking. 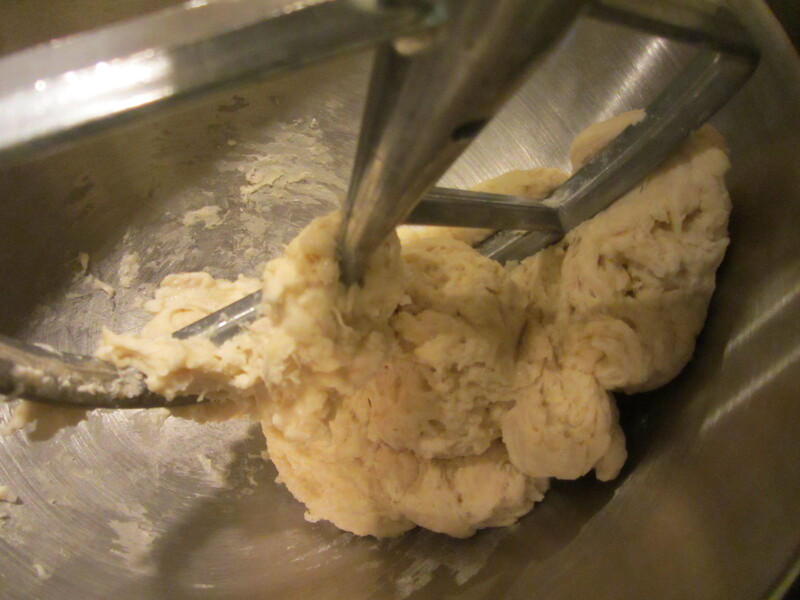 If your dough tears, knead it longer. 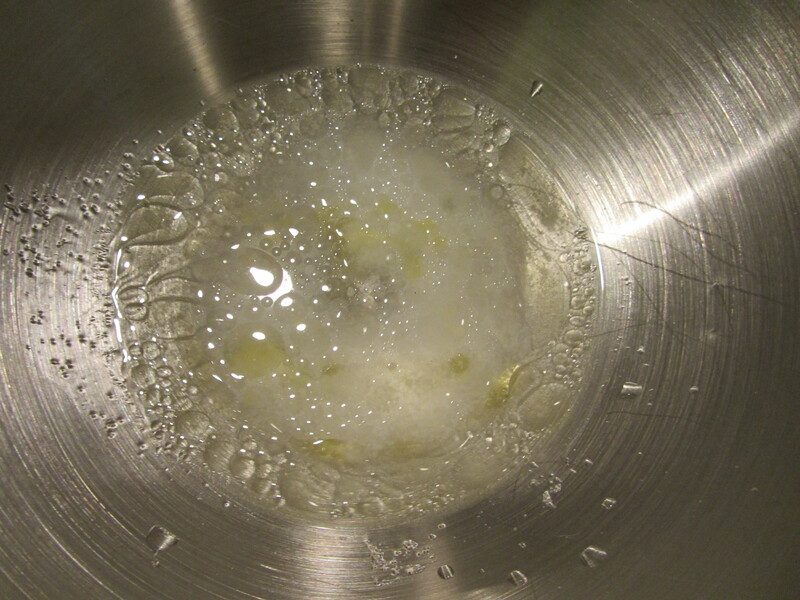 Once your dough has passed the windowpane test, form it into a nice, smooth ball, place it in a large bowl, add 2 t of olive oil, and toss to coat. 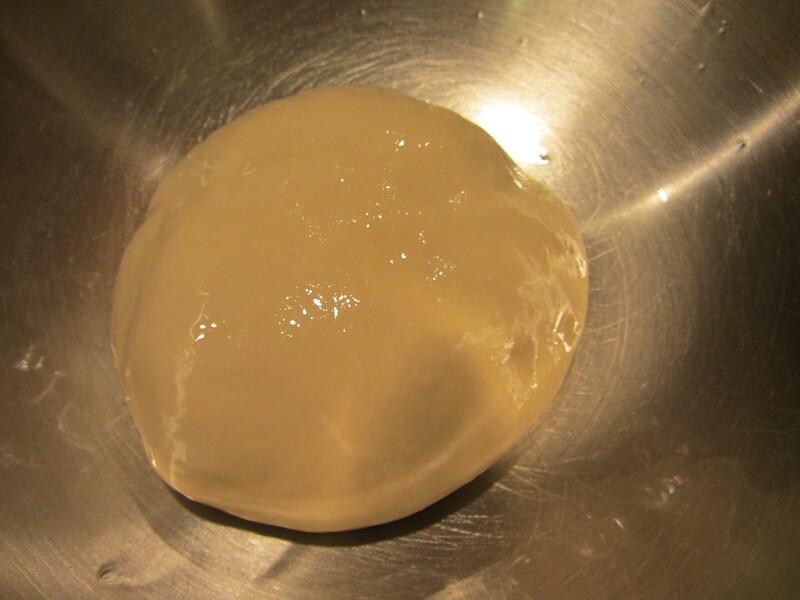 Dough formed into smooth ball. 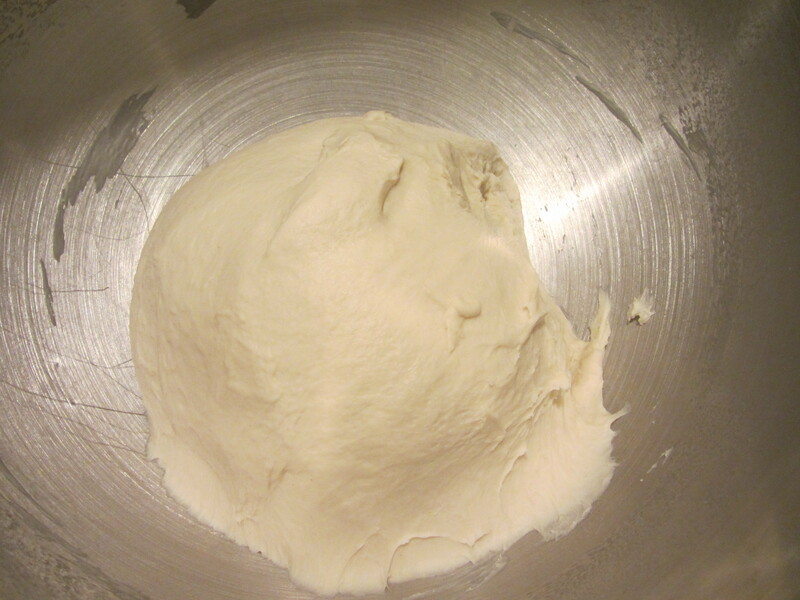 Dough in large bowl with olive oil. 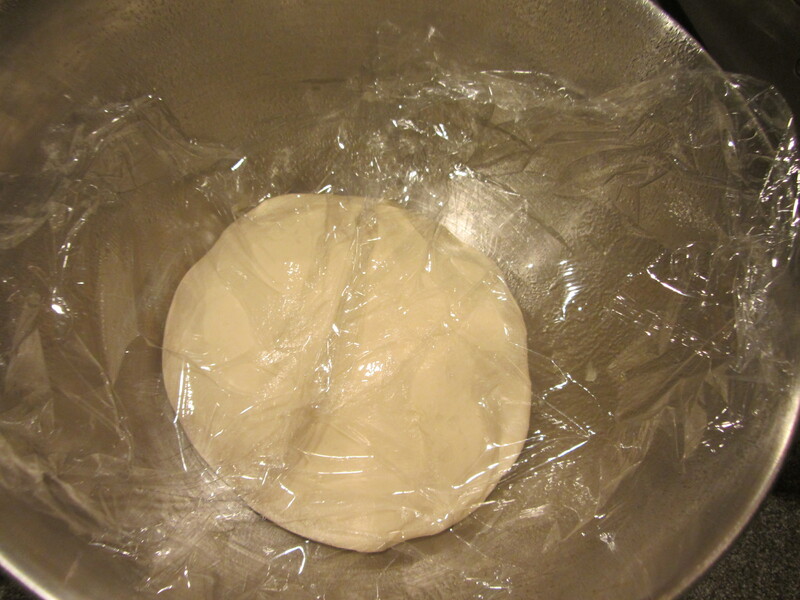 Loosely cover the dough with plastic wrap and refrigerate it for 18-24 hours. 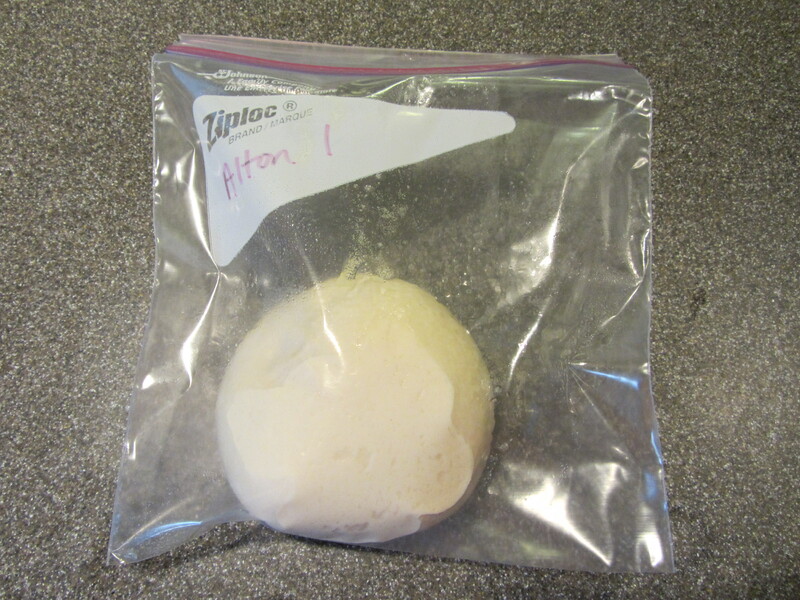 Allowing the dough to rise in the refrigerator results in a slower rise, which Alton says produces better flavor and more delicate structure. Covered loosely with plastic wrap. 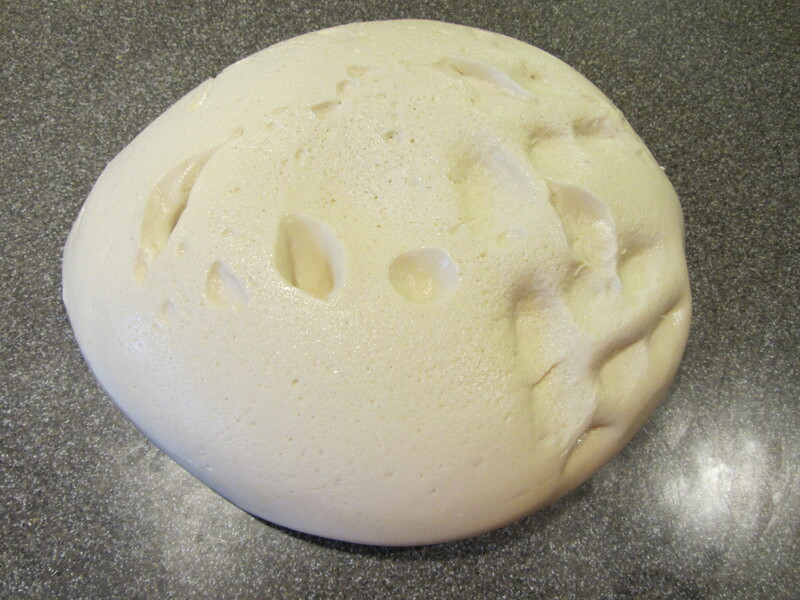 Dough after rising in refrigerator for ~24 hours. 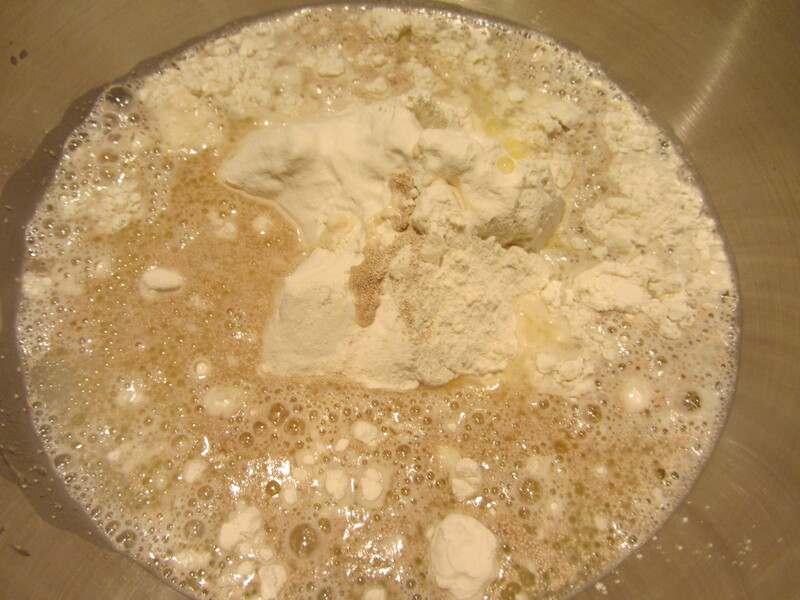 Mash each dough ball with the heel of your hand to get rid of any bubbles, and reshape the dough back into its original ball forms, folding the dough under itself. 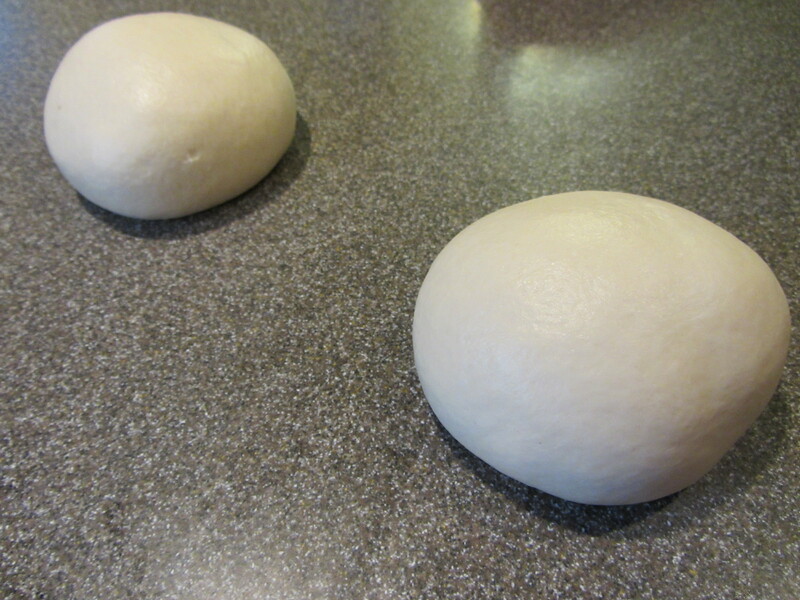 Barely wet your hands and rub them on your work surface, placing the dough balls on top. 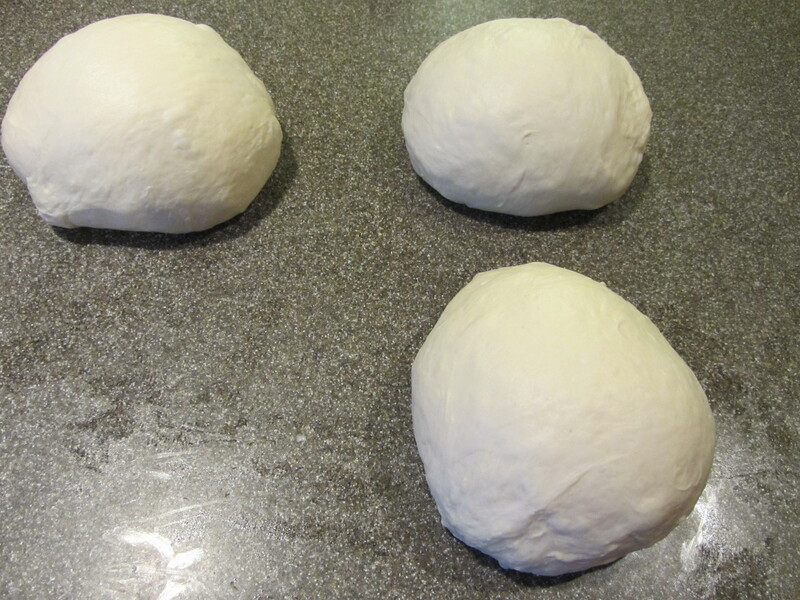 Roll the balls with both hands, not moving your fingers, until you have very smooth dough. 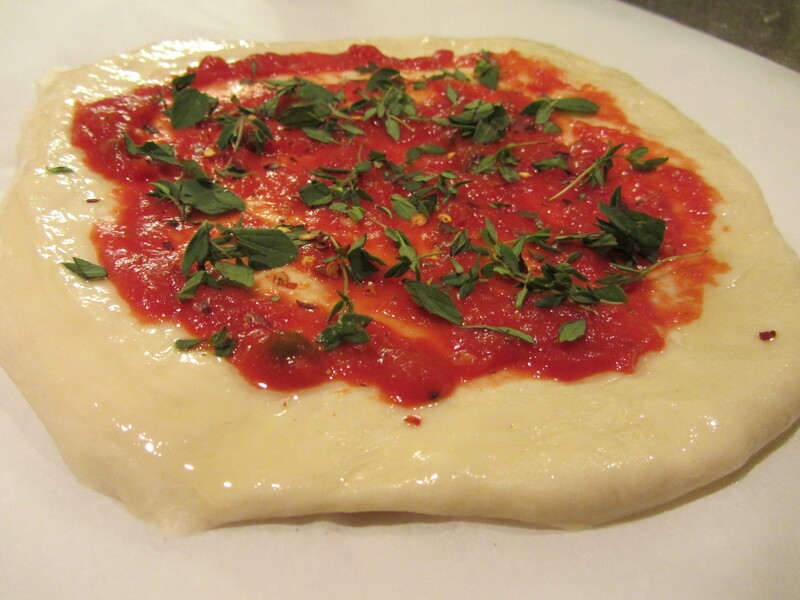 Set the dough aside, cover it with a tea towel, and let it rest for 30 minutes. 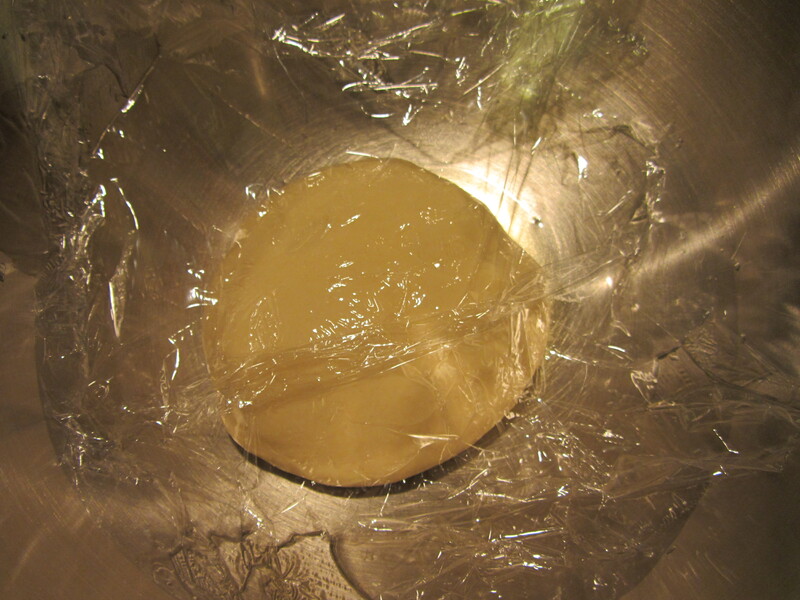 Or, to save the dough for another day, instead of letting it rest, place it in a ziplock bag sprayed with non-stick spray and refrigerate for up to 6 days. I opted to save half of my dough for a pizza another day. 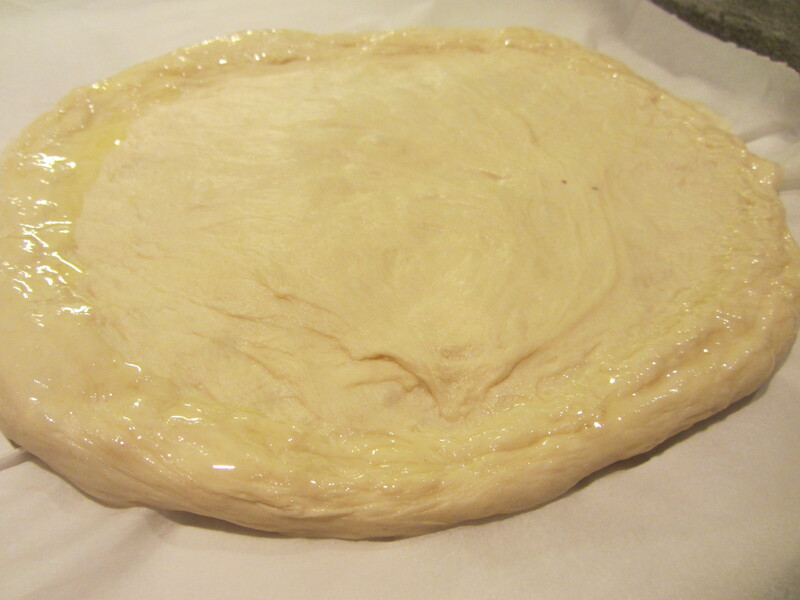 Half of dough back into refrigerator for later use. One of Alton’s tricks in pizza making is to build your pizza directly on your pizza peel, which is something I discovered a few years ago. Alton uses a wooden peel, dusting it with flour. 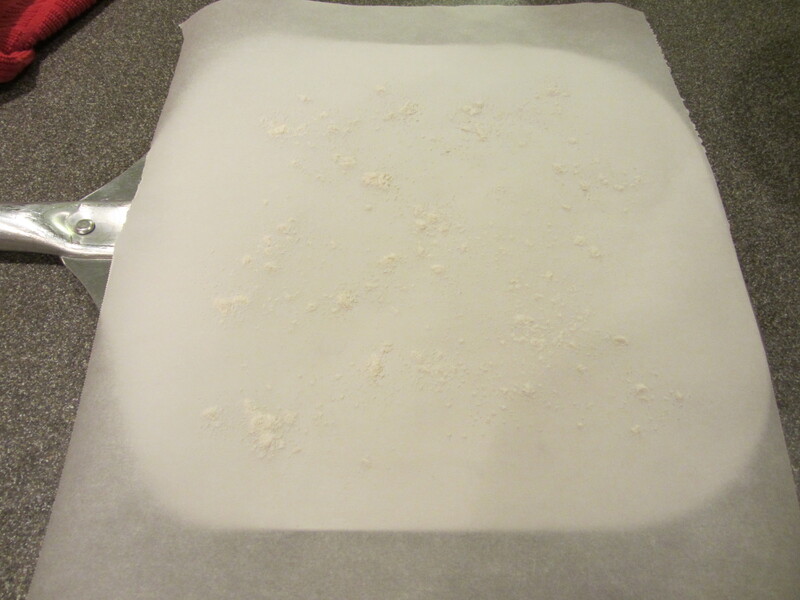 I have metal peel, so I use a sheet of parchment paper to ensure my pizza doesn’t stick to my peel. 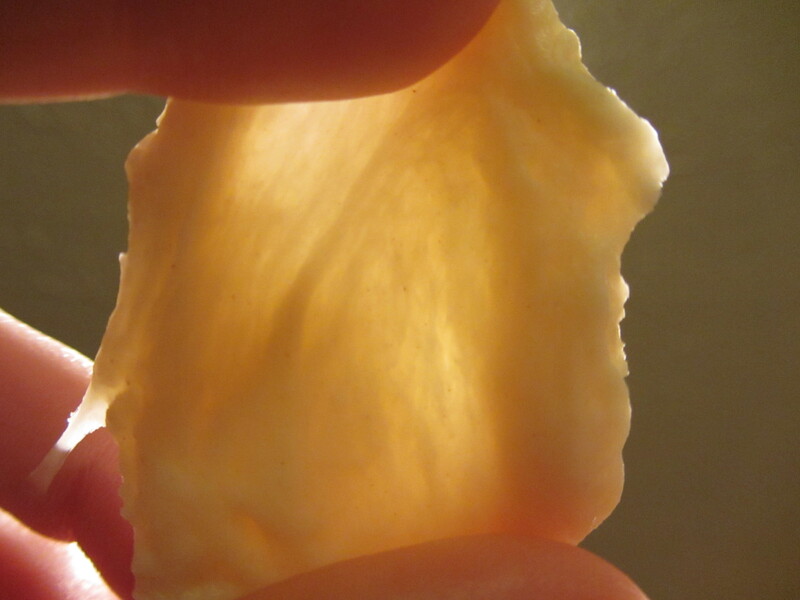 Parchment paper on metal pizza peel. Pizza to be built on peel. 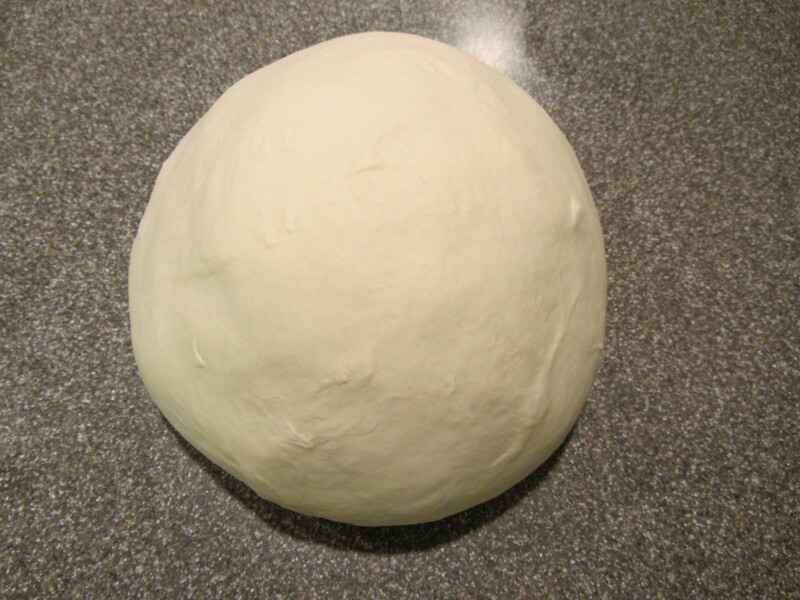 Flatten the dough into an even disc with the heel of your hand, turning the dough as you flatten. 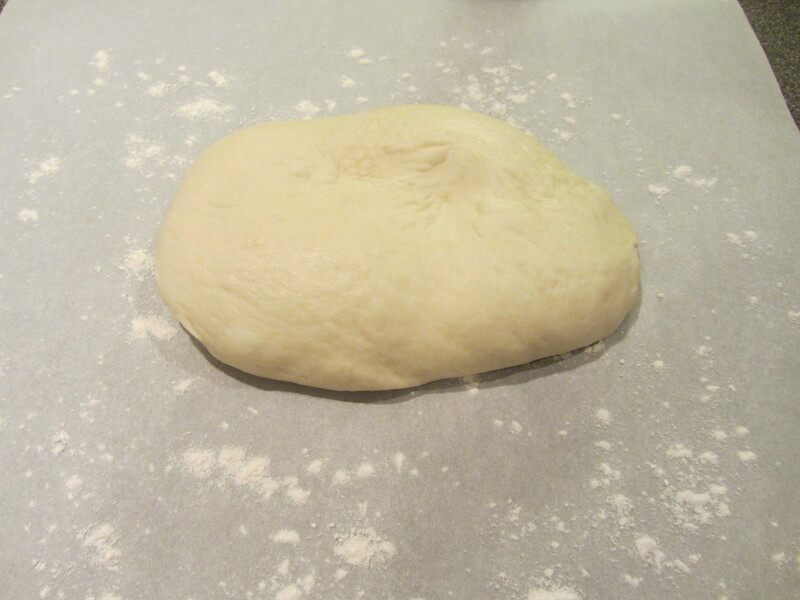 Pick the dough up, rotating it as you pinch a lip about an inch deep around the edge. 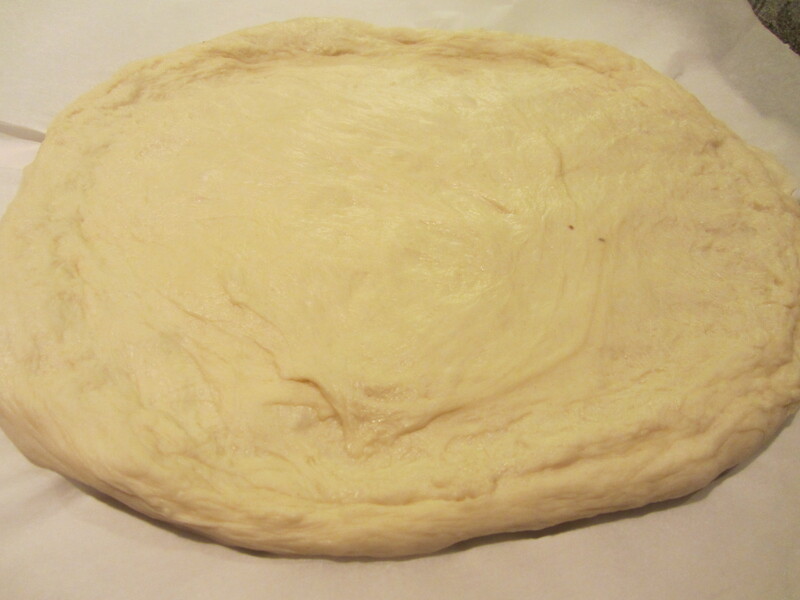 Pass the dough back and forth between your hands, rotating it. Use your knuckles to spin, toss, and catch the dough. Or, alternatively, you can stretch/pull the dough on the peel. 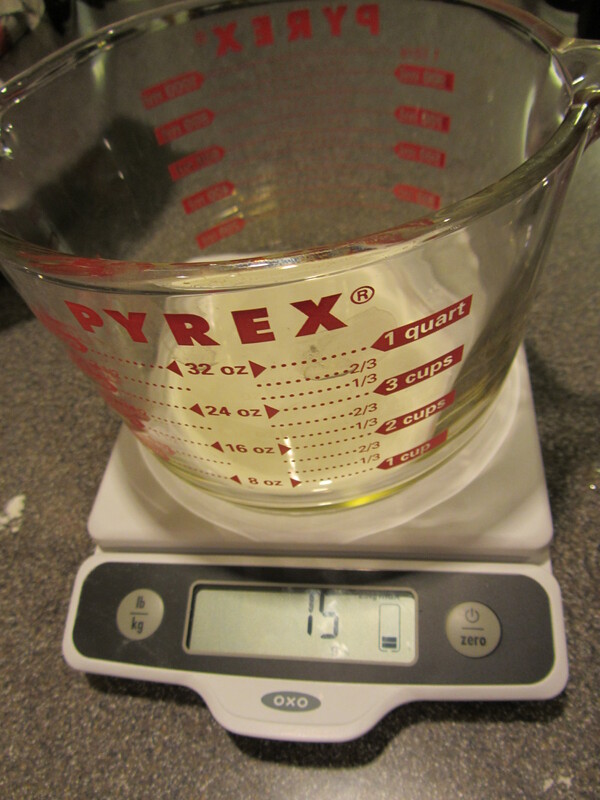 If you find that your dough keeps shrinking, you can let it rest longer until it is easier to work with. At this point, you can choose whether you want a crispier or chewier crust; for a crispy crust, you will decorate/bake immediately, while you will want to let your dough rest for an additional 30 minutes to get a chewier crust. 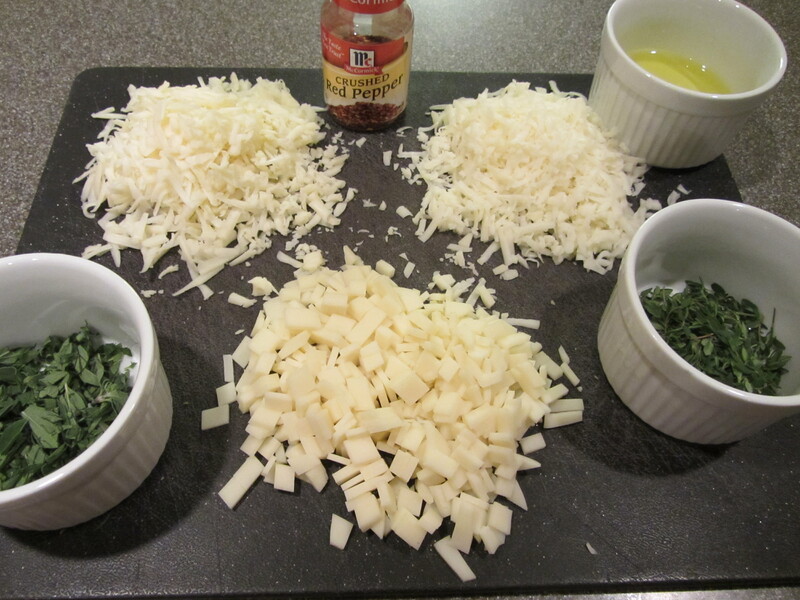 Toppings for pizza: olive oil, fresh oregano, fresh thyme, mozzarella, Monterey Jack, provolone, and crushed red pepper. 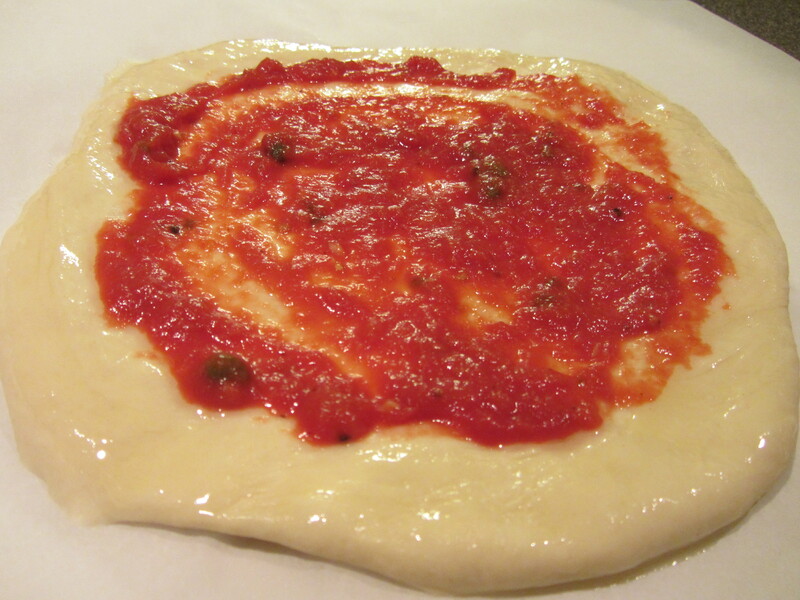 Either way, when ready to bake, brush the lip of the dough with olive oil. Lip brushed with olive oil. 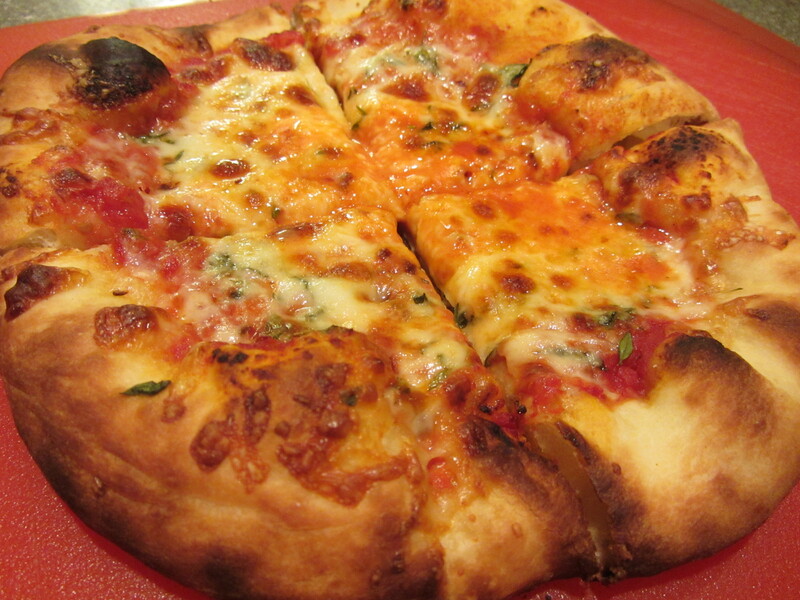 To decorate a pizza Alton’s way, top the pizza with sauce, using as little as possible. Alton recommends that you use about 3 T of sauce. 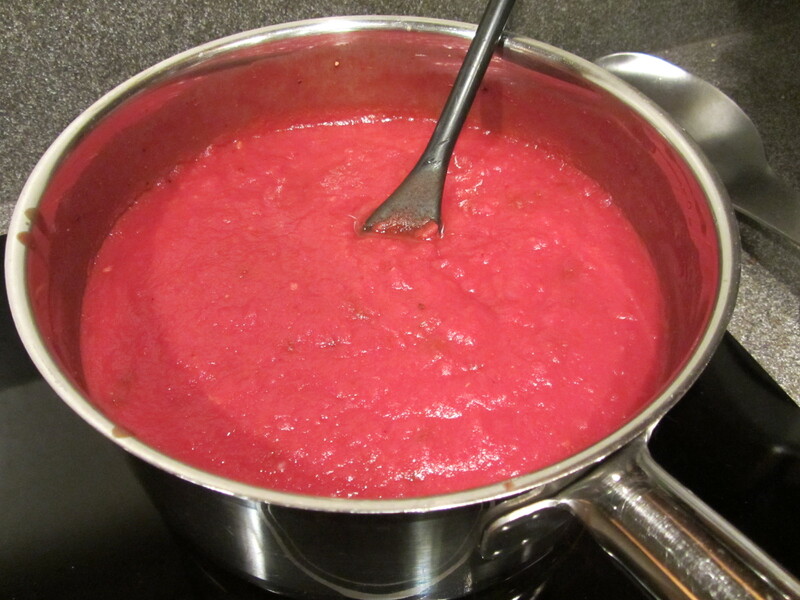 You can use whatever sauce you like; I used a homemade red sauce. Over the sauce add fresh thyme, fresh oregano, and some crushed red pepper flakes. Sauce topped with fresh oregano, fresh thyme, and crushed red pepper. Finally, sprinkle on a blend of shredded mozzarella, Monterey Jack, and provolone cheeses. 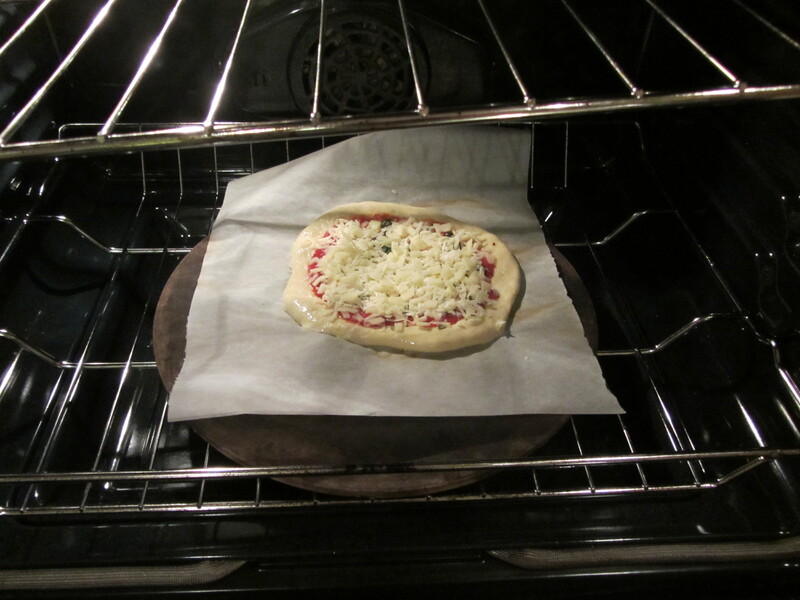 Bake your pizza for 7 minutes, and allow it to rest for 3 minutes before cutting. 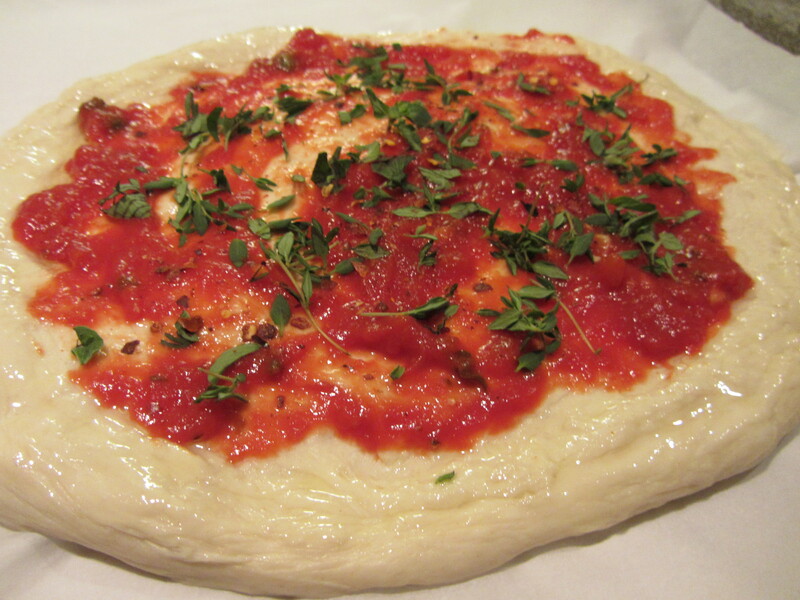 We really did like Alton’s pizza dough, though I did think it was a little bit salty. If you read the online recipe, Alton has added a note about cutting back on the salt, but I made the dough as he made it on the actual show. 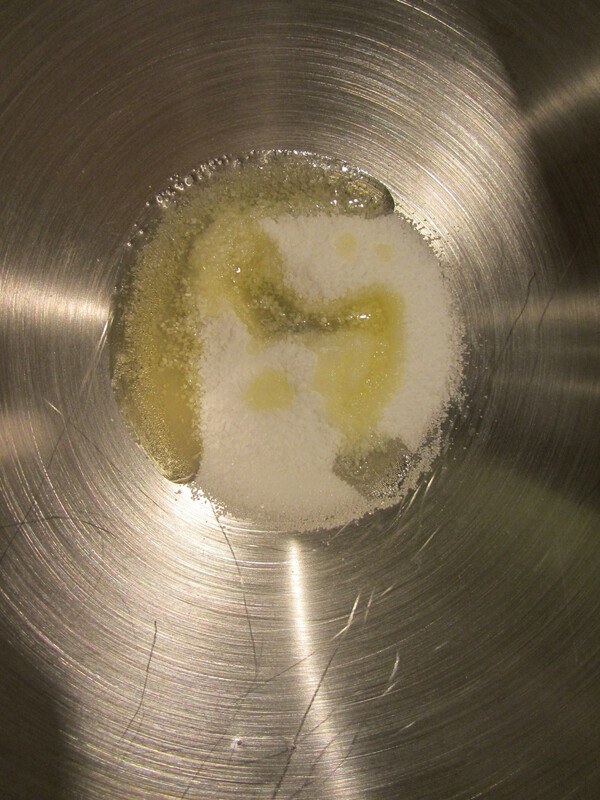 Since Ted is a salt lover, he thought the dough was great, but I would cut the salt back slightly. We did both agree that Alton’s dough had more flavor than our regular dough, and the texture was great. The dough was crispy and golden on the outside, and chewy on the inside. 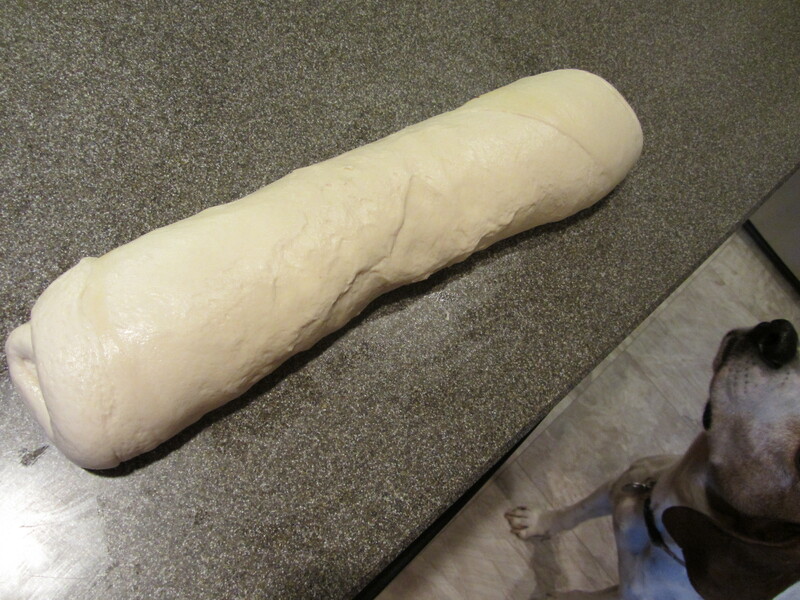 I did find the dough to be slightly difficult to work with, as it kept shrinking on me as I tried to stretch it, but a little more resting time seemed to take care of that. 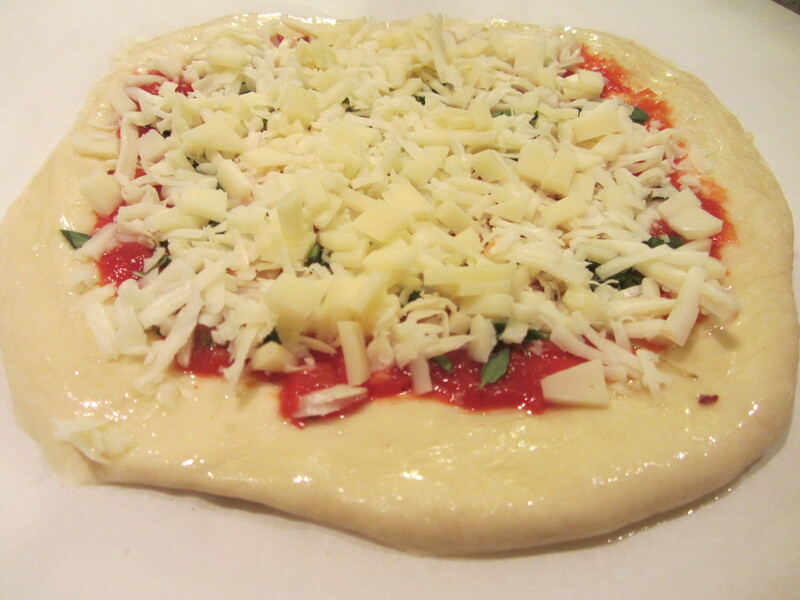 We had the pizza again the next night, and the dough was slightly easier to work with. 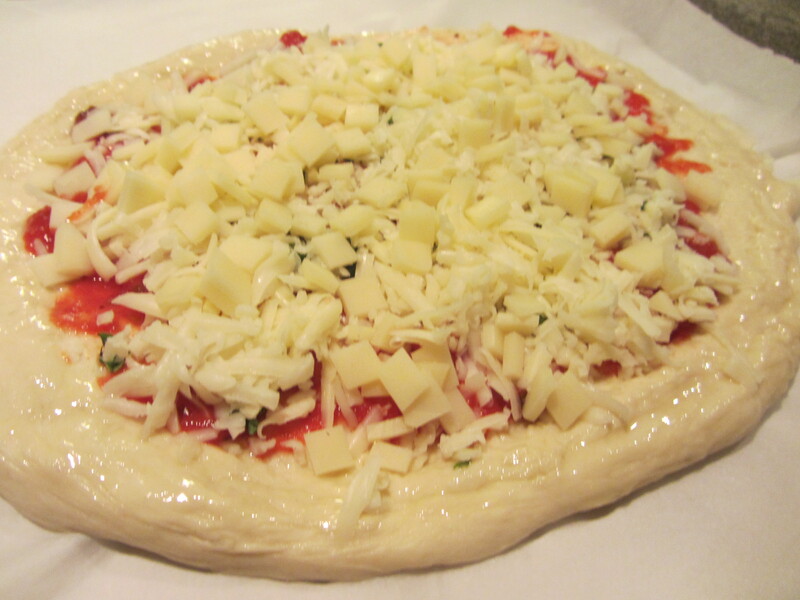 I am tempted to make this again, portion it out, and freeze it, as I think it would freeze nicely. I happened to discover a few weeks ago that Alton has posted a new pizza recipe on his website, claiming that it is superior to the original Good Eats dough and that it is the only pizza dough he will “ever need.” So, although this recipe has nothing directly to do with Good Eats, I decided I had to make it to compare side-by-side with the original Good Eats dough. 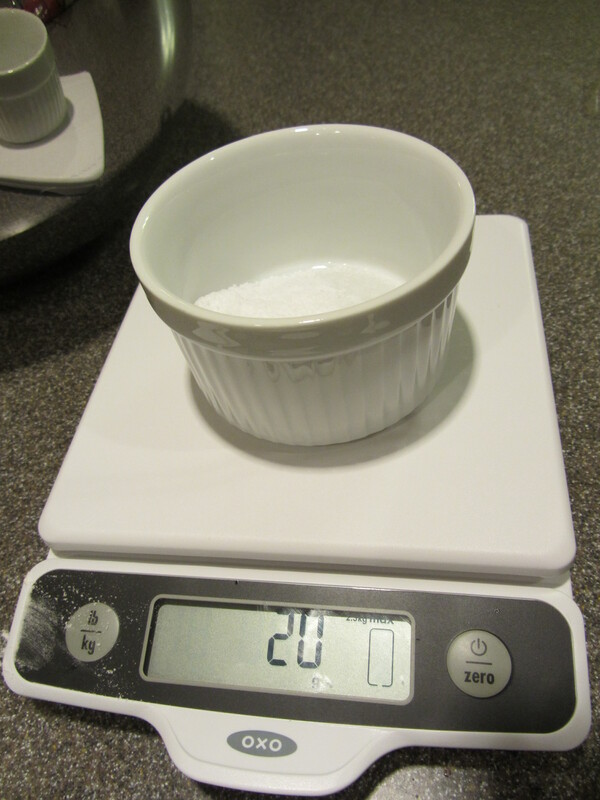 I won’t go into the step-by-step procedure in detail, but I will post photos of the process. 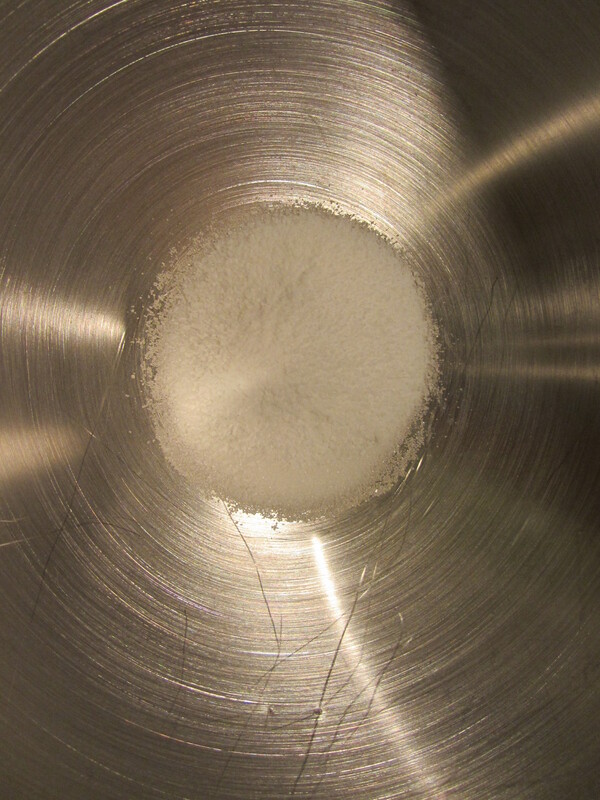 Dry ingredients for Alton’s new pizza crust: bread flour, active dry yeast, sugar, and Kosher salt. 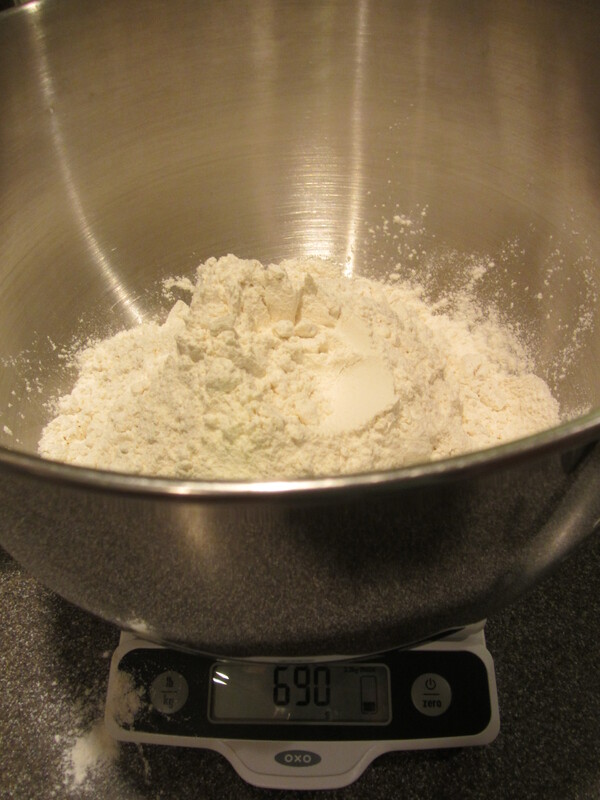 690 g of bread flour. 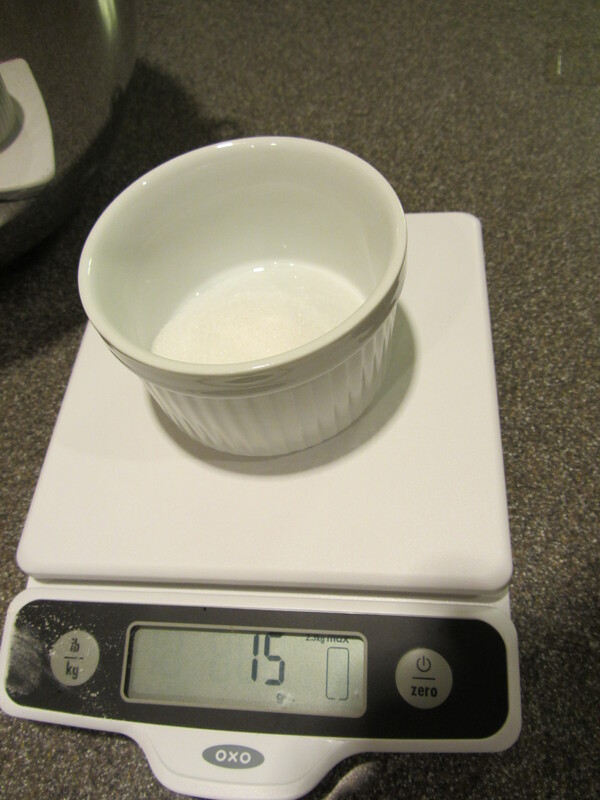 9 g of active dry yeast. 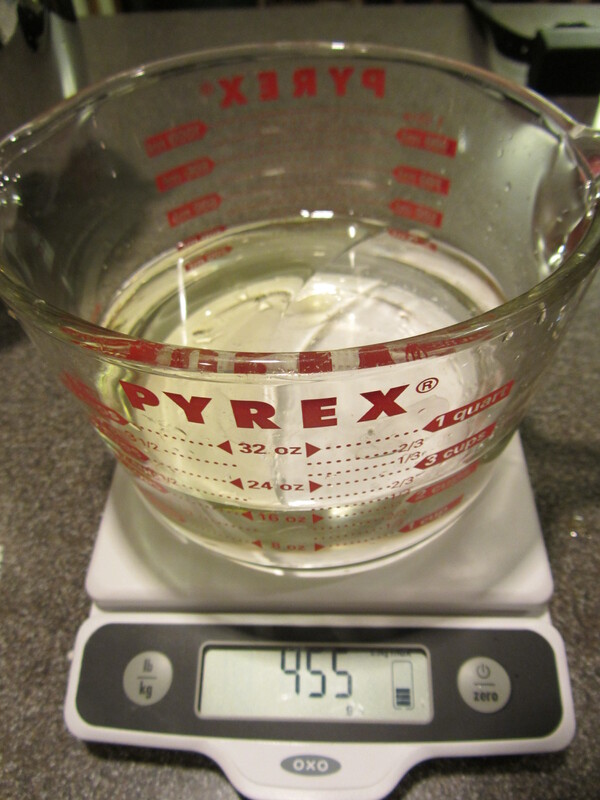 455 g of water. I used tap, rather than bottled, water. 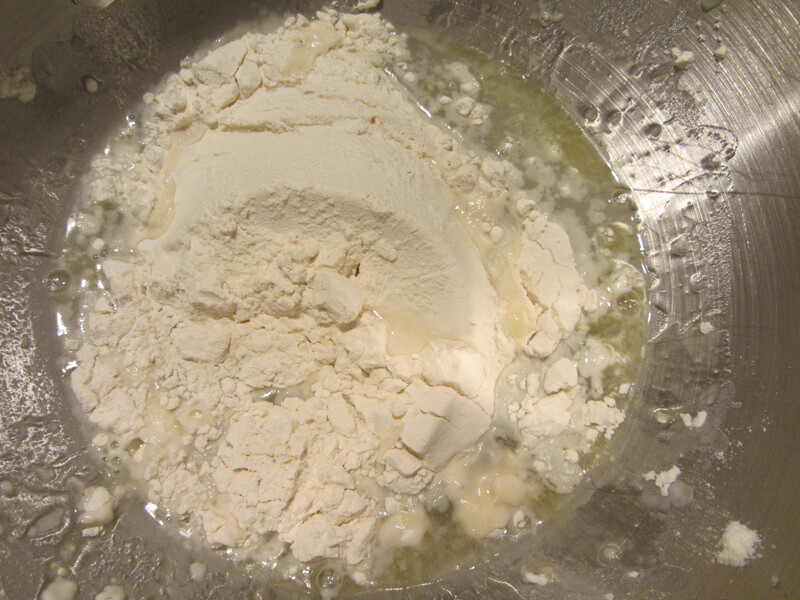 Wet ingredients added to dry. 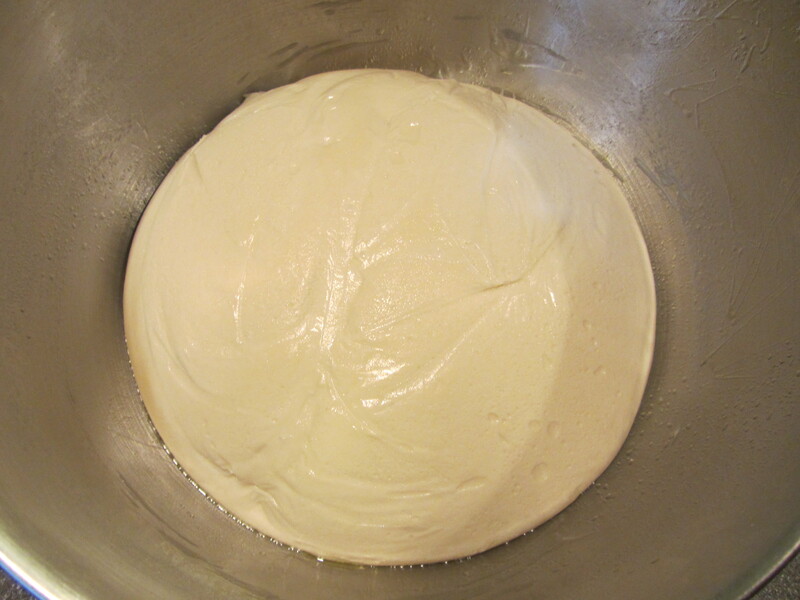 Dough just pulling away from sides of bowl. 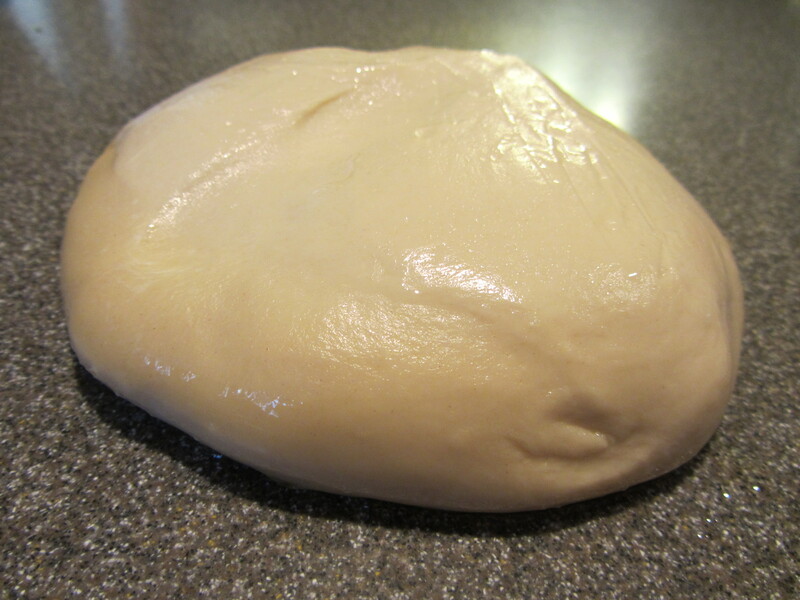 Dough after 5 minutes of kneading on medium. Formed into a smooth ball. 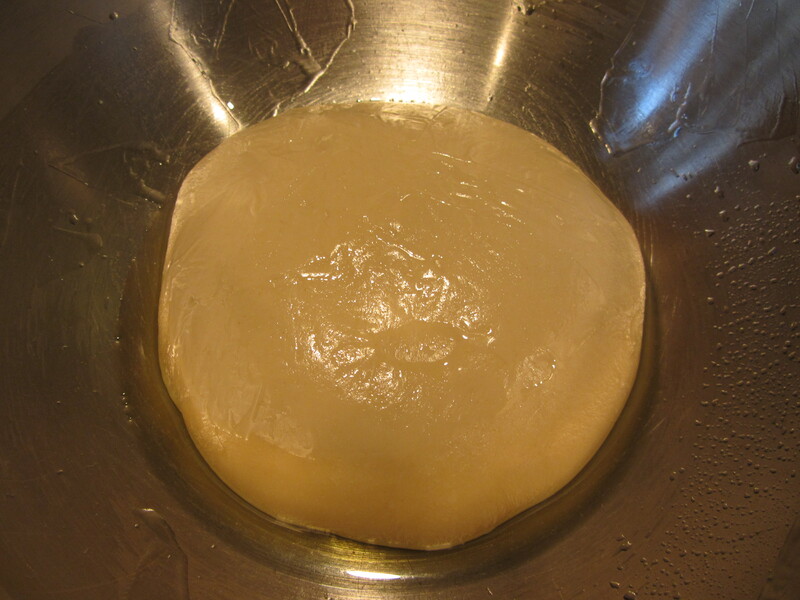 Into an oiled bowl, covered with plastic wrap, and into the refrigerator for 18-24 hours. 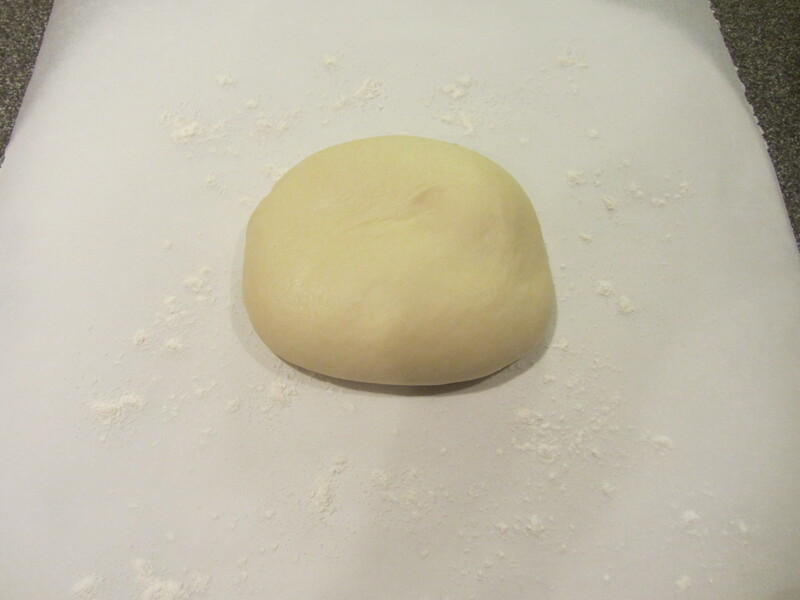 Dough rolled up to be cut into thirds. 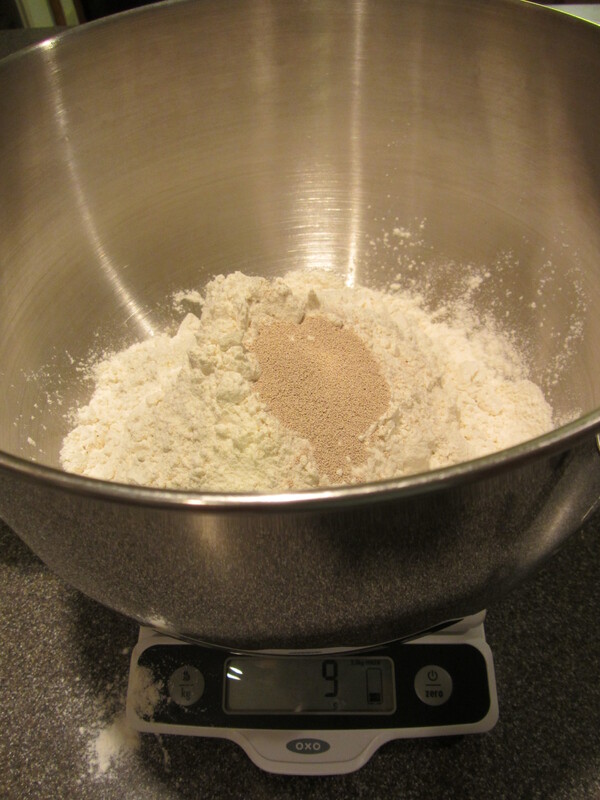 Dough portioned into three balls. 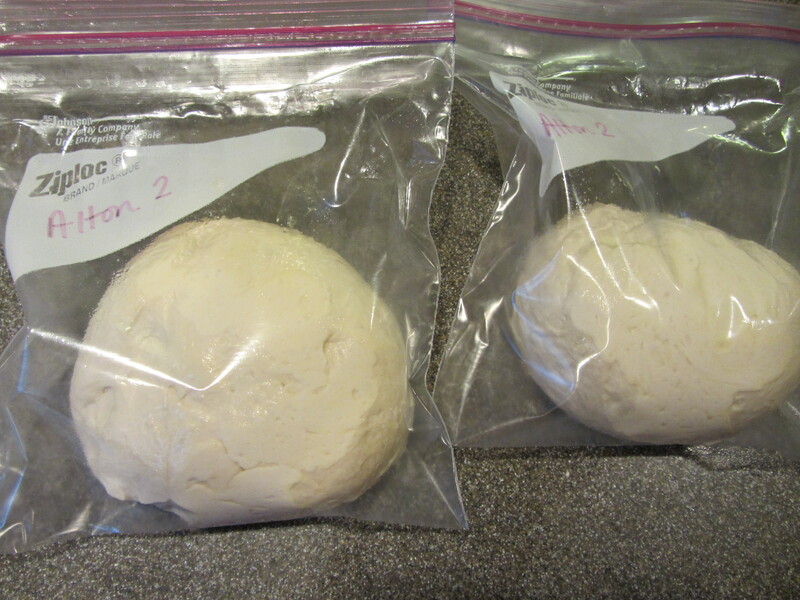 Two balls of dough back into refrigerator for later use. 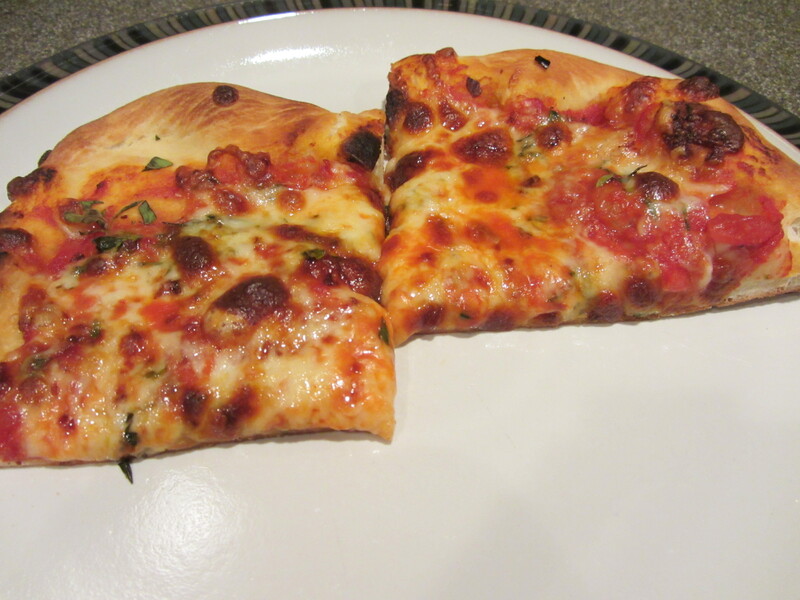 Dough topped with sauce, fresh thyme, fresh oregano, and crushed red pepper. What are the differences between this recipe and the old one? 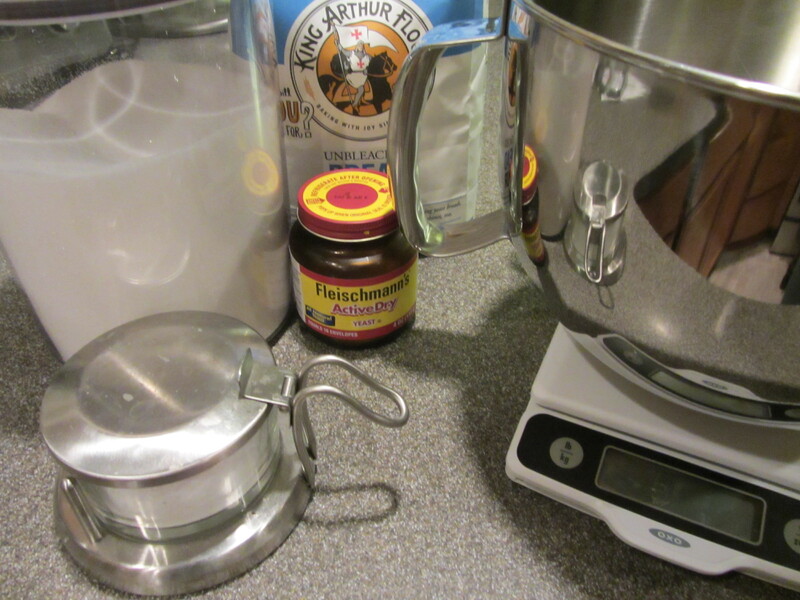 This recipe uses active dry yeast, in contrast to the use of instant yeast in the original recipe, and everything for this recipe is weighed in grams. Also, Alton tells you to use this dough within eight hours after the 18-24 hour rise, while you had up to 6 days for the original dough. 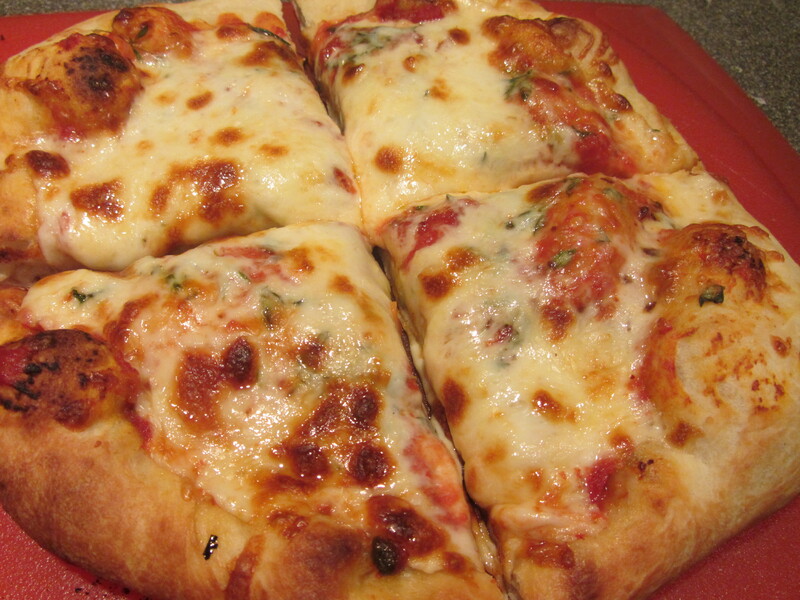 Oh, and this recipe yields three pizzas, while the original gives you two. 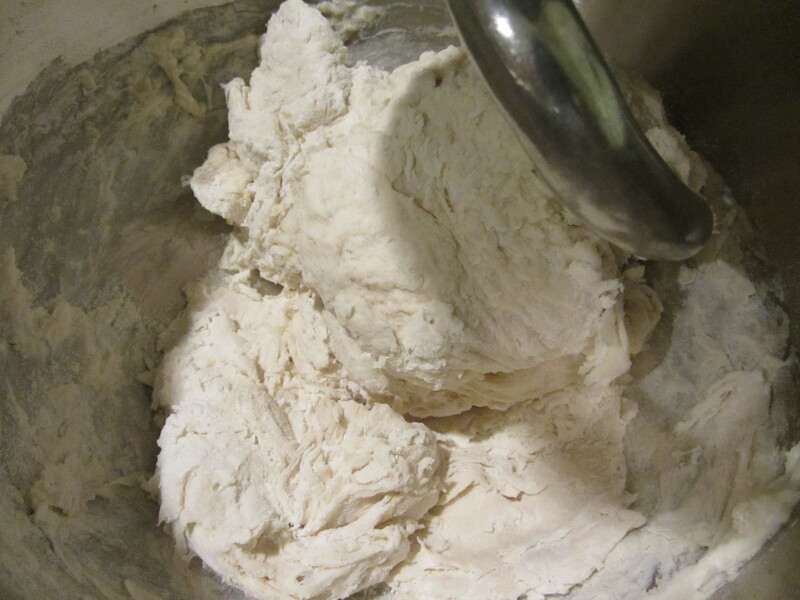 The procedures for the two doughs are essentially the same, aside from the fact that this dough gets kneaded by the mixer for 5 minutes, rather than 15 for the original dough, and Alton goes straight to the dough hook for kneading, rather than using the paddle first. We literally ate this pizza three nights in a row, comparing it directly to the original dough the first two nights. 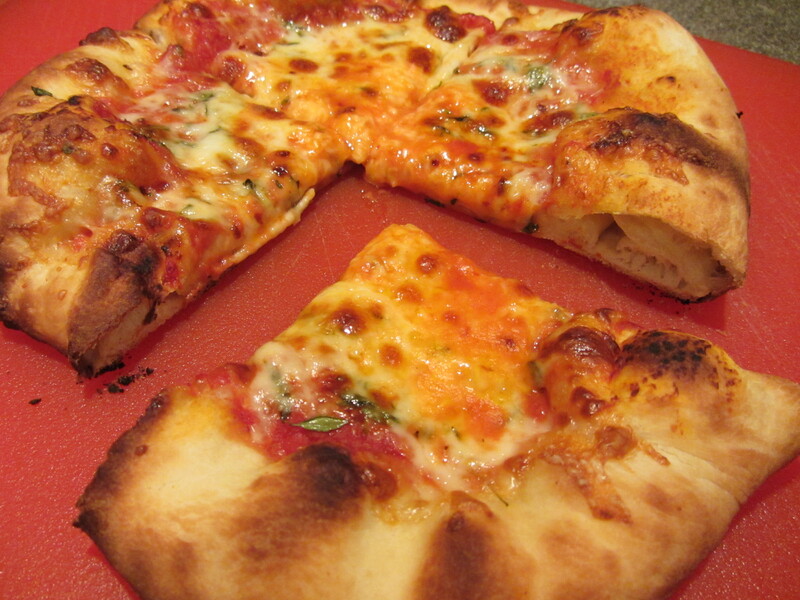 This, too, was a good pizza, but I think we preferred the original dough. Why? The original dough was less airy and chewier. Also, it was just as good the second day as it was the first, whereas the new dough seemed to become too bubbly for the second and third nights. 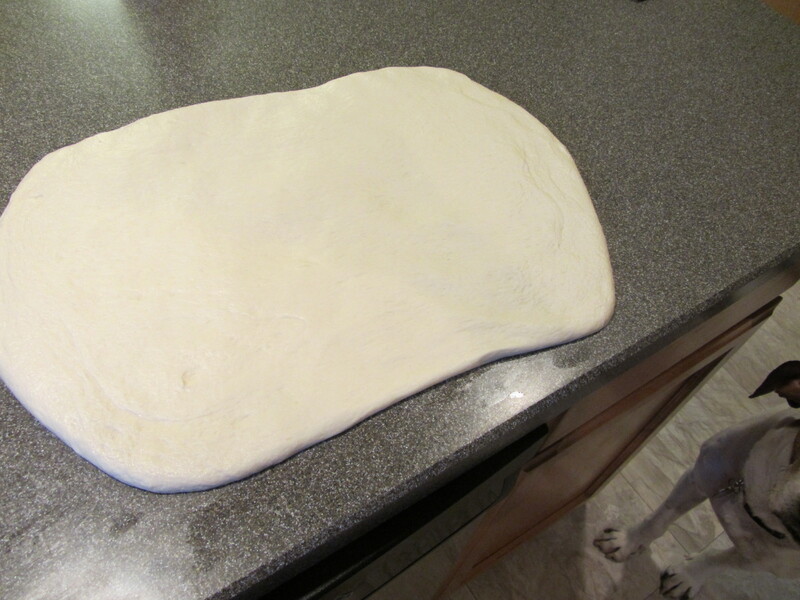 I also found the original dough to be smoother and slightly easier to work with when forming the pizzas. 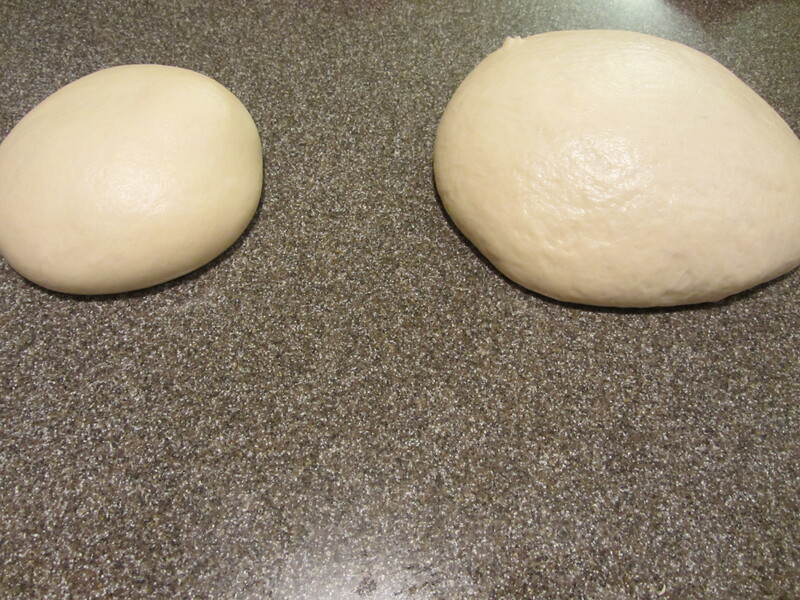 Dough side-by-side: original dough on the left. 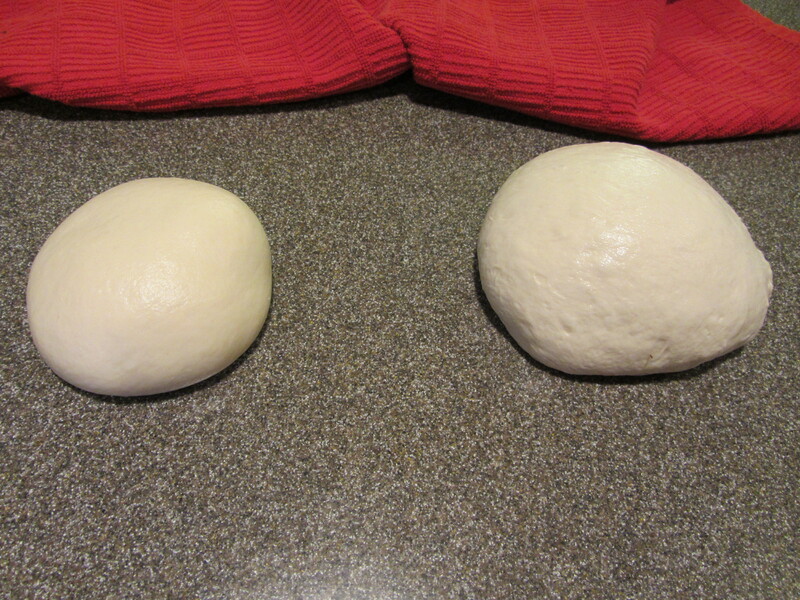 New dough on the right. 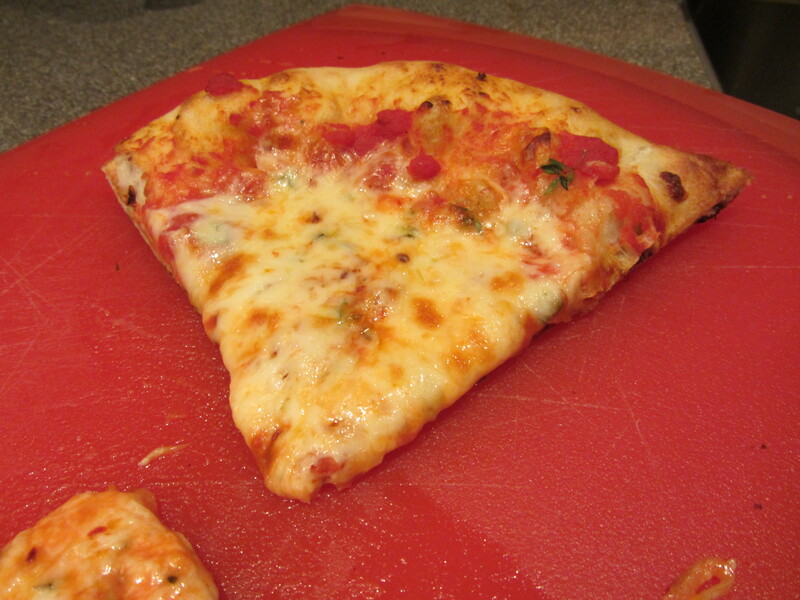 Original pizza, cut into slices on day 2. New recipe, cut into slices on day 2. Alton’s new pizza on day 3. 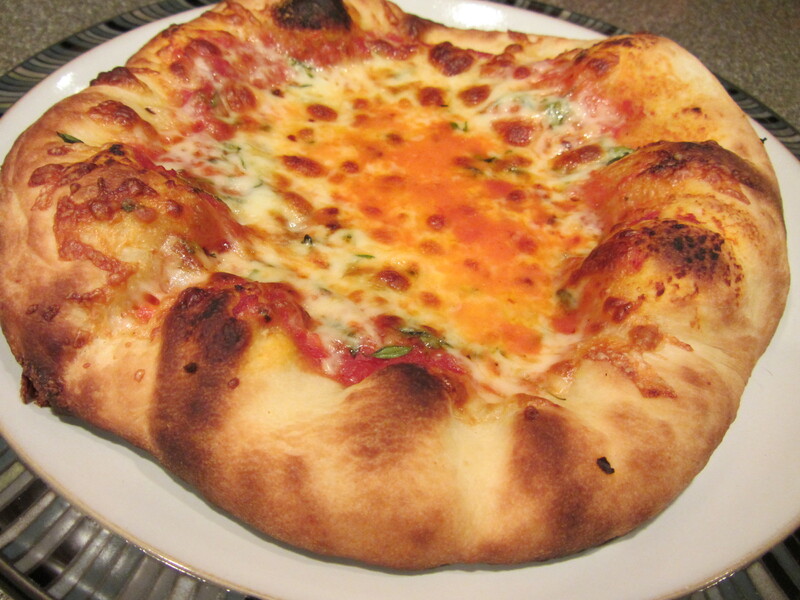 Crust is awfully puffy and bubbly. While Ted and I agreed that both dough recipes were great, we would choose the Good Eats recipe (with slightly less salt) over Alton’s updated version. Either way, you can’t go wrong, and a lot of it comes down to personal preference. So, will I be giving the boot to my go-to recipe of the past few years? 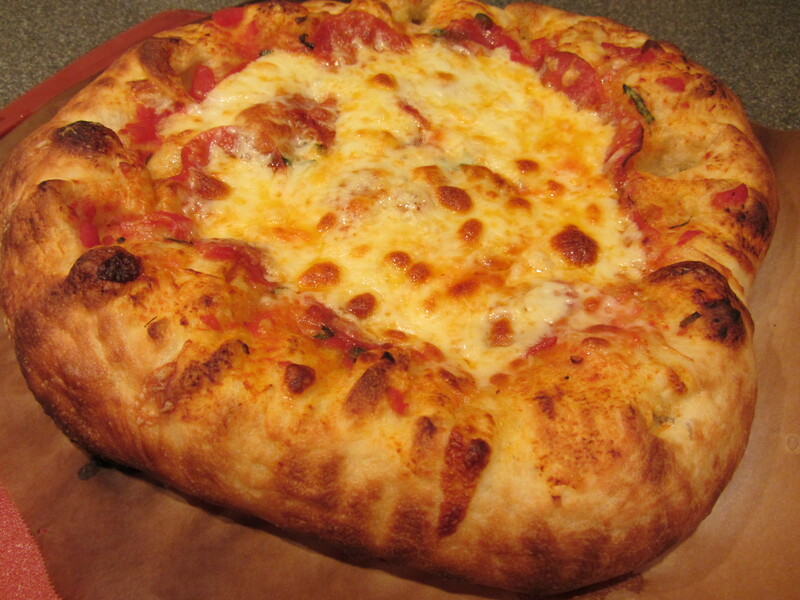 No, but I think I will be adding Alton’s original dough to my regular pizza repertoire.